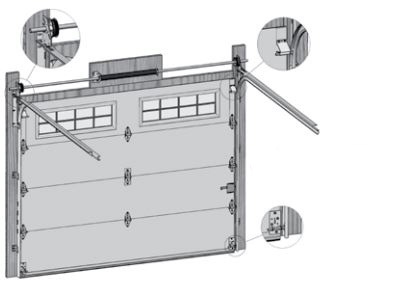 This spring system is located either above the garage door opening for a standard lift, or at the ends of the horizontal tracks for a low headroom lift (double horizontal rails). A TORSION system requires more headroom (standard: 12" / 30 cm; low headroom: 4" / 10 cm) above the door. Add 2 inches (5 cm) if you plan on installing an electric door opener. 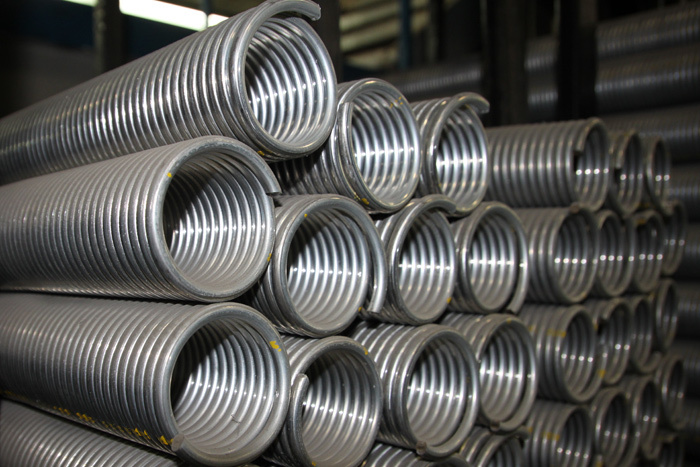 Because a torsion spring is installed in a shaft and thus stays in place if it breaks, it is safer. It is recommended for doors over 14' / 4.3 m wide. A torsion system is quieter than an extension system. This spring system is installed over the two horizontal tracks. It needs less headroom space (8" / 20 cm). Add 2 inches (50 mm) if you plan to install an electric door opener. The installation of safety cables is strongly recommended with this system. If the spring breaks, these cables will hold the spring in place. Not used for doors over 8 ft / 2.4 m high. For your safety and that of your loved ones, we recommend contacting one of our garage door technicians to evaluate the state or possible replacement of your spring system. You can also get a free written estimation. How long does a spring last? Springs for residential doors typically have a life span of around 10,000 cycles (1 cycle = 1 opening/closing). Depending how often you use your door, this means, on average, 6 to 7 years. What can cause a spring to break? Occasionally, there is a manufacturing defect, especially seen in the first two years, but normally it’s wear and tear that can cause a spring to break. In addition, if your garage is very humid, it may cause rust to form on the springs, reducing their lifespan. In this case, we can provide you with galvanized springs that are well suited for this condition. Lastly, very cold temperatures, under -40°F / -20°C, may cause a number of springs to break when we most need our cars. It must be remembered that your spring system is calibrated based on the total weight of the door, on average 150 lb. / 68 kg for a single door, and more if we are talking about a door in solid wood. Can we foresee that a spring will break? Not really… It’s like a lightbulb that stop working with no warning. I have a door opener, so it’s not serious if my spring breaks, is it? A door opener only does what you would do manually. Your garage door must always be well balanced by the spring system. A well-balanced door weighs about 8 to 10&nbps;lb. / 3.5 to 4.5 kg, and can be lifted with only one hand. If you door seems to weigh more than that, you’ve identified a major problem. It is very likely that your spring system is out of balance. Contact us without delay. Don’t forget that if your door opener can lift up to 250 lb. / 110 kg, it can also push this same weight down which could really put you at significant risk. Can I extend the life of my springs? Yes, by correctly lubricating them. See our installation manual. Is it possible for me to change a spring by myself? We don’t recommend it because, as explained in the previous points, the entire weight of the door is transferred onto the spring system and the anchor plate that holds it. 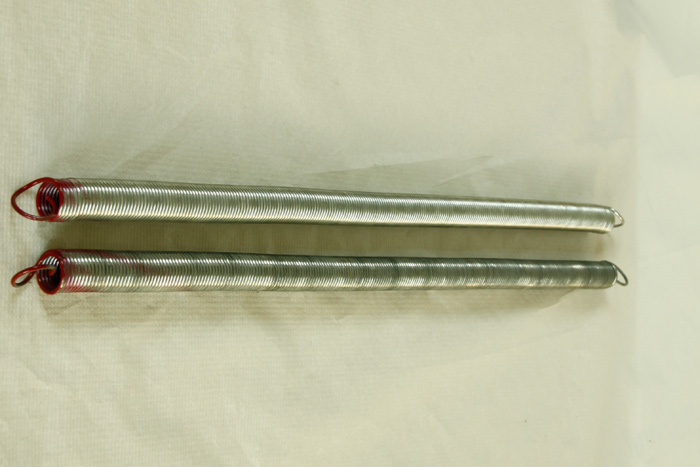 All of this is under extreme tension (lower hinge – lifting cable – drum – spring). If you notice that a spring is broken and you have a door opener, you can, as a temporary fix, open the door with the door opener to get a car out. However, contact us as soon as possible to correct this situation. Place the door off limits immediately so that it can’t be used by anyone. We provide prompt repair services because we keep all the necessary replacement parts in inventory. What’s more, we guarantee our work and the parts to be changed. We will also take advantage of our visit to adjust other components that may be in need. If we see that other parts require changing, we will contact you before doing any work and give you an idea of the replacement cost.